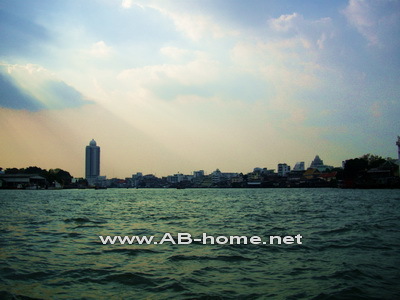 The Sawatdee GH is located in Sri Ayuttaya Road in Thewet Bangkok. It’s established way back in 1981 and one of the budget accommodation options close to the Khao Sarn Road. The rooms are very simple with fan but for 400 Baht it’s very resonable if you looking for a cheap option to stay in Thailand’s capital. The service is friendly and around are some nice restaurants like the Sri Ayutthaya. The Sawatdee Guesthouse quiet rooms with fan and to the river express boat which brings you to Wat Pho, Wat Arun or to the Sky Train is just a short walk over the crowdy market of Thewet. 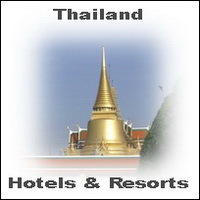 More Bangkok Hotel deals here. The Millennium Hilton in Bangkok is a top hotel on the river side of Thailand’s capital. The Bangkok Millenium Hilton has 5 stars and offers luxury accommodation and deluxe suites over the roofs of Bangkok in Thailand. This ultra modern luxury hotel in Bangkok is a good choice for tourists and business traveler who like great views and comfortable rooms in one of the best hotels in Thailand. From the restaurant you can watch over the roofs of this Asian metropolis. The Hilton Hotel Bangkok is not the cheapest but a great accommodation in central Bangkok. The 543 suites and rooms have all river view and a lot of comfort. If you looking for luxury accommodation and deluxe rooms next to the Chao Phraya river than you are right at Millenium Hilton Bangkok in Thailand. Check In and feel the exclusive atmosphere of this boutique hotel in Thailand. Hippie de Bar Bangkok is a cozy bar on the Khao San Road in Thailand. 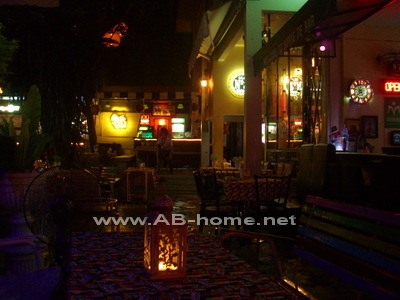 This open air bar is located in a small soi on Bangkok’s traveler street. The Hippie Bar has all kind of beverages and food. The soft bright and the breezy ambience and the colorful atmosphere make Hippie de Bar to a unique Khao San Road Nightlife experience. Chummy people and friendly waitresses make the Hippi de Bar to this what it is: a leading Bar on Khaosan Road in Bankok. The beverage prices are reasonable and the best choice for an evening with self minded people are the yummy cocktails and draft beer. Hippie de Bar offers as well good western and Thai food. This Bar in Bangkok is a good choice for quiet nightlife in Bangkok. 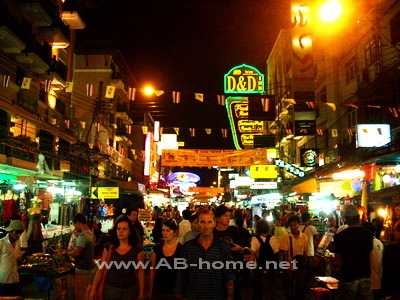 This bar is rightly a leading location for backpacker, locals and tourists on Khao San Road in Thailand. 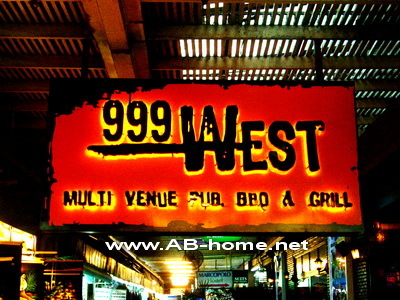 The 999 West Bar Khaosan is located in the Susie walking street in Bangkok’s backpacker street Khao San Road. The cozy bar has a pool table and a rustic ambience for long nights and exalted Khao San Nightlife. The 999 West Bar (former Susie Pub) in Bangkok is a popular meeting point for open minded travelers who like to go out and enjoys drinking cocktails and cool beverages in hot nights in Thailand. This Bar in Khao San Road is perfect for pool table matches and relaxing from the last long travel day in Bangkok. The prices at 999 West are reasonable. As ell for budget traveler is 999west a good option to spend a night in a Pub at this busy street in Thailand’s capital. The Rider Resort Bangkok is 300 meter away from Seacon Square mall on the Srinakarin Road in Thailand’s capital. The great view and the clean rooms make Riders to a good middle class accommodation in Asia. To Suvanabhumi Airport it’s just some minutes by taxi. Rider Resort in Bangkok has a cozy beer garden and bar with live music. The quiet environment and the nice view to a lake are perfect for people who looking for a quiet place in central Bangkok. The nearest sky train station from the Rider Hotel is On Nut. From there you can take a taxi which is about 300 Thai Baht (2010). 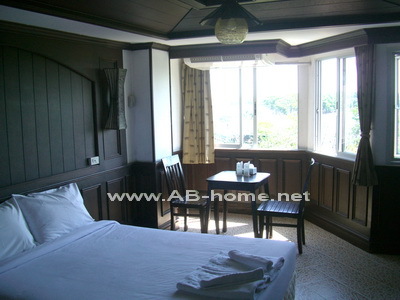 The prices for the rooms are between 1200 and 1800 Baht inclusive breakfast (2010). All rooms are appointed with TV, mini bar, air condition and hot water bathroom with a bathtub. The Bar of Rider Resort is a popular location for bikers and pool table fans. The Rider restaurant is open all day and night and serves Thai and Western dishes for reasonable prices. Riders is a good choice if you like Bangkok Hotels with flair in a friendly atmosphere not far from the airport. 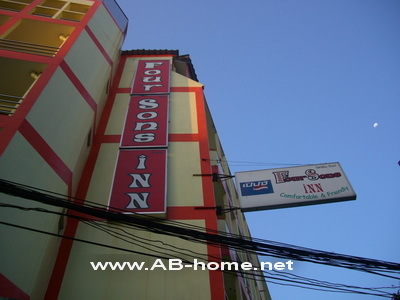 Four Sons Inn is a budget hostel in Bangkok. This Thailand hotel for traveler is located next to Khao San Road and offers simple rooms with air con, TV and an own bathroom. 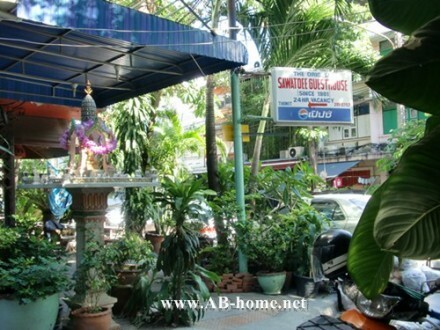 Four Sons Bangkok is perfect for backpacker who likes to explore Kao San by walk. To the middle of Bangkok’s main destination for Asia traveler it’s just 100m. The rooms are cheap, comfortable and clean. Around Four Sons Guesthouse are some beer gardens, clubs and restaurants for a pleasant Thailand vacation and Southeast Asia travel tours. Four Sons village is another nice Guest House of the Four Sons group at Khao San Road in Bangkok. From Four Sons Inn you have the chance to enjoy the shopping and nightlife by walk. For relaxing are many massage shops with spa packages around Four Sons Hostel in Bangkok Thailand. We paid 550 Thai Baht in 2010 for a good room with air condition and a window with a great view over Thailand’s travel road nr. 1. The Nat Guest House is direct in the heart of Khao San Road in Bangkok. This Hostel in Thailand is a popular choice for backpacker who looking for a cheap Khaosan Road Guest House with simple rooms. 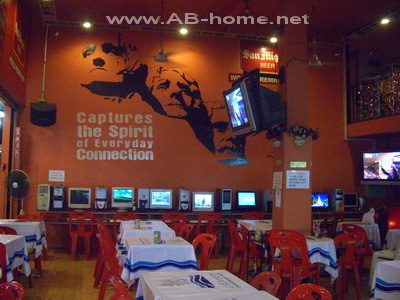 Nat Guest House Bangkok offers internet service, restaurant, bar and of course guest accommodation in Bangkok. From Nat is easy to explore Khao San and Bangkok city. Around the Nat Hostel are many bars, restaurants and massage shops to go out and enjoy the nightlife in Bangkok’s backpacker street Kaosarn. The friendly service and the open minded guests make Nat Guesthouse to a unique travel accommodation in Thailand. You will find Nat Guest House next to Susie walking street at Kao San in Bangkok Thailand. This hostel is very popular because of the international flair and the cheap prices which are perfect for budget travel tours through Thailand in Asia. 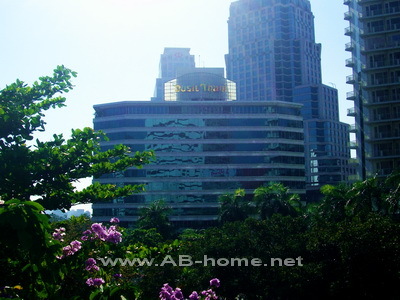 The 5 Star luxury hotel Dusit Thani is located in the city center next to the Lumpini Park in Bangkok. This Dusit Hotel Bangkok offers deluxe accommodation for vacation and honeymoon in Thailand’s capital. The Dusit Thani Bangkok is a leading city hotel which is established since over 25 years. The rooms and suites have a great view over the skyline of this Asian metropolis. Dusit Thani Hotel Bangkok attracts many tourists and business traveler with a great service, gym, spa packages and swimming pool in the heart of the capital of Thailand. The Dusit Club Suites are perfect for tourists who like light hearten holiday in an accommodation with style and flair. Dusit Thani has more than 500 deluxe rooms and suites. The closeness to many famous sights makes this hotel in Thailand to a perfect destination for all who like to explore the center and the main sights of BKK in Thailand. For room reservations and bookings for the Dusit Thani Hotel follow this link. Dusit Princess Srinakarin Hotel is a 4 star luxury hotel in Bangkok. The hotel is located next to Seacon Square shopping mall in Bangkok’s Bangna district. 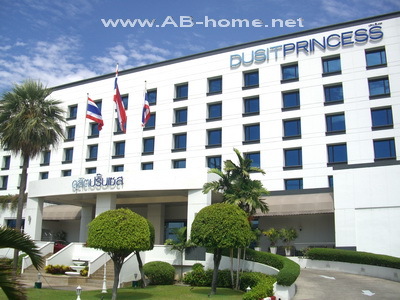 Dusit Princess Bangkok offer good accommodation in Thailand for business traveler and luxury tourists who like comfortable rooms for a deluxe holiday in Thailand’s capital. This hotel has rooms and beautiful suites not for from Suvarnabhumi Airport Bangkok. Dusit Princess Hotel Bangkok has a swimming pool, 24 hour room service, tour booking office, limousine service, babysitting and Thai Massages. The spa packages offer stream bath, sauna and massages for your relaxing. The nearly 200 rooms of this accommodation are appointed with air con, satellite TV, internet connection, IDD phone and a working desk for business traveler in Bangkok. From Dusit Srinakarin it is as well not far to the center of BKK. The main touristic and sightseeing sites like Wat Pho, Wat Arun and Wat Phra Kaew are easy to reach by taxi or limousine. For more information’s about Thailand travel possibilities and tour bookings please contact the reception at Dusit Srinakarin Bangkok. For Dusit Princess Srinakarin booking and reservations click here.